A+ Interactive Math is having another awesome promotion. For the remainder of October you can get a monthly subscription for ONLY $8.00 and a quarterly subscription for ONLY $20.00 (after applying my 20% off coupon code. No contract is required and you will be locked into this price for as long as you renew! If you want to find out why we love A+ Interactive Math by A+ TutorSoft so much read our full review here. In addition to this awesome promotion here are two awesome FreeBEEs for you too! Download your FREE Pumpkin Math printables (click the link or click on the photo below). 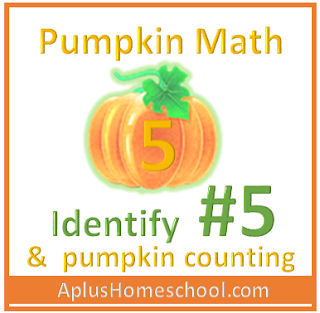 This is freebie was designed to help you teach your little pumpkin with counting and identifying the number 5! And I have another freebie for you too. FREE Elementary and Middle School Multiplication CD Software ($21.99 value for FREE - Coupon Code Required). To claim your FREE download click this special offers link. Next click the gold Download Now button, register and then enter this special code APLUSMATH (code expires October 31, 2013). You will receive a download link via the email that you specified when registering.